If you’ve landed on this page then you have obviously gotten past the disturbing title, and you want to find out for yourself the answer to the question of why do dogs eat dog poop? As embarrassing as it is for us dog owners to even talk about the subject and admit that we have a poop eating dog, it is actually a very common problem. What we see as a disgusting and repulsive form of behavior, is actually quite common in dogs. The scientific name for poop eating is “Coprophagia”, and those who have never heard of it might think it is some kind of fancy food item, well… to some dogs it is a delicacy. Coprophagia is often one of the reasons that dog owners try to re home their dog. There are some dogs that eat poop, while others do not, and some dogs will only eat their own, and others will only consume the poop of other animals. So weird and confusing right? If you have a poop eater at home, don’t despair because the reasons why dogs eat poop fall into 2 categories, medical or behavioral, and there are ways to discourage this disgusting habit. A mother dog who has a litter of pups will lick her puppies as a way to encourage them to eliminate, the mother will then lick the feces clean in order to keep the den area clean and scent free. This is a natural instinct, and in the wild mothers do this as a way to keep potential predators away. The mother dog will usually stop eating her puppies feces around the time the puppies have started to consume solid food, and are able to leave the den to eliminate. This instinctive behavior is passed on to puppies, and puppies will often eat their own feces. Some puppies will grow out of this behavior, and some puppies will continue to eat poop into their adult lives. It is a learned behavior, along with the curiosity that leads them to smell and eat their own poop, or poop of another dog. This instinctive behavior is seen in the wild, and it can be discouraged at home by the breeder. The breeder should clean up after the puppies, so that the puppies will not have a chance to eat their poop. Besides being a natural instinct, there are other reasons that may motivate your dog to eat the feces of another dog or animal, or their own. The reasons behind poop eating can be classed into 2 categories, behavioral and medical. Your dog may result to eating poop as a way to relieve stress and anxiety. Dogs who are in confined spaces like a kennel, or locked in a basement all day alone, are more likely to eat poop than dogs who have human interaction throughout the day. Dogs love any attention given to them by their humans whether it is a good reaction or bad reaction from you. If you have witnessed your dog eating poop for the first time, then I’m sure you reacted by shouting loudly in disgust. Your dog will anticipate this loud reaction and eat poop just to get your attention. Dogs are natural scavengers, they are always on the hunt for food and will follow any scent. 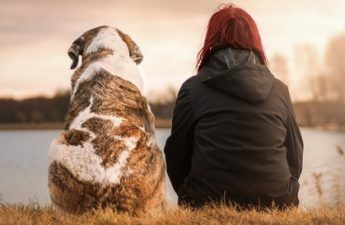 Unlike humans, dogs are not grossed out by feces of other dogs or other animals, and just might take a bite out of something that smells good to them. Other dogs feces may contain an ingredient that your dog finds tasty. Perhaps your dog is eating the feces of a dog that has been fed human food, and enjoys the taste. Dogs will also eat other animals waste such as cow and horse manure, and cat poop. Cow and horse manure may contain undigested corn or other stuff your dog will find appealing, and cats are often fed a high protein diet that will be appealing to your dog. Dogs are also drawn to rabbit poop, which is loaded with digestive enzymes and B vitamins. Dogs who are left alone all day with nothing to do will become bored, and the opportunity of eating poop may present itself. Dogs who have received harsh house training by being punished for pooping in the house, or who have had their noses rubbed in their poop, will think that poop is bad and will eat the evidence to avoid being punished. If your dog is outside in the yard all day, and there are numerous piles of dog crap lying around, your dog may resort to eating poop, as a way to tidy up his space. Dogs that are fed a highly processed diet such as kibble often lack digestive enzymes needed to properly absorb their food. A dogs body will naturally create digestive enzymes, but not enough to effectively complete the digestive process. Dogs need to get digestive enzymes from their food. Before dogs were domesticated they were catching and eating their food in the wild. They would eat their prey, and that included everything, guts and all. Digestive enzymes would naturally be present in the guts of their prey, giving them the appropriate amount they needed. The modern canine diet is often lacking in digestive enzymes, and dogs result to eating poop as a way to get their enzymes and nutrients that they need. Your dog may have an imbalance of healthy gut bacteria. Dogs are often prescribed Antibiotics and other drugs, which kill any healthy gut bacteria naturally found in your dogs gut. Dogs with this condition also known as (EPI), create very little or no amount of digestive enzymes in the pancreas. Dogs with this condition will show symptoms of starvation, weight loss, diarrhea, and poop eating. If your dog has intestinal parasites, it could be a reason why your dog is eating poop. Intestinal parasites absorb the nutrients that your dog should be getting from food, so your dog will eat poop in order to replenish his nutrients. 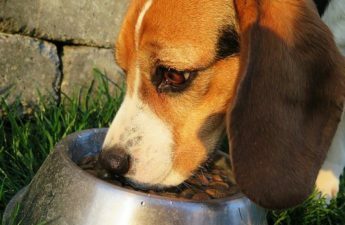 There are certain diseases such as diabetes and thyroid issues that can increase a dogs appetite. Dogs will become so ravenous that they will eat anything they can find. Drugs such as steroids will also increase your dogs appetite. While on steroids your dog will be hungry all the time, and will eat anything, even poop. If you are not feeding your dog enough food, your dog will look for other food sources such as poop. Is Poop Eating Harmful To Your Dog? When your dog eats his own poop it is not going to do your dog any harm, other than the foul breath, and the ick factor, but if your dog consumes the feces of other dogs or animals there is a risk of health problems, especially if the poop has parasites, viruses or toxins. If your dog has allergies and consumes poop that contains an allergen, then that will cause problems for your dog. Whenever your dog consumes poop from an unknown origin, your dog is at risk of getting sick. While eating their own poop may not be harmful, poop eating should be discouraged and stopped. Not only is your dog at risk of getting sick, there is a potential that you may get sick as well, if your dog licks you. If you notice your dog eating poop, you should make sure to visit your vet in order to rule out any medical issues. If your dog has a clean bill of health, then you will need to address the behavioral reasons. Feed at Regular Intervals. If you are feeding your dog once a day, consider feeding 2 or 3 times a day to keep your dog more satisfied and less hungry. Start by changing your dog’s diet. As we determined earlier, the modern canine diet which is kibble, is highly processed and lacks digestive enzymes that your dog needs. I recommend feeding your dog a raw food diet, that consists of a variety of quality proteins. Raw food contains digestive enzymes that your dog needs. Restore Your Dog’s Gut Health. Probiotics are a great way to restore your dogs gut health. Probiotics add healthy bacteria into the gut. Pick-up After Your Dog. Clean up any dog poop immediately, and keep your dogs area clean, to avoid the temptation. Keep your dog on leash. Supervise your dog while walking, by keeping your dog on leash. Keep Cats Litter Box Clean & Away From Dog. If you own a cat, you will want to keep the litter box in an area that your dog can’t get to. A good idea is to place it in a small space such as under the stairs, and have a stair gate with a flap door big enough for only your cat. Practice Good Recall Commands. Work on the “Leave It” and “Come” command, and offer a treat to your dog when he obeys. Provide plenty of exercise & mental stimulation. Keep your dog from getting bored, by offering plenty of playtime and exercise, and make sure your dog has plenty of toys to help keep him entertained. Don’t punish your dog. When you see your dog eating poop, naturally you will be disgusted and want to yell at your dog, but your reaction may cause excitement in your dog, making your dog more interested in the poop. There are certain home remedies that claim to prevent your dog from eating poop, such as feeding your dog pineapple and pumpkin. Dogs like the taste of pineapple and pumpkin, but it makes their poop taste awful. While pineapple and pumpkin are healthy for your dog, feeding too much can be a bad thing. Pineapple contains a lot of sugar which is not good for your dog, and feeding an excessive amount of pumpkin can provide your dog with a toxic amount of Vitamin A. Another poop deterrent is sprinkling Tabasco sauce, cayenne pepper, or lemon juice onto your dogs poop. Seriously?? If you have the time to go outside into the yard and sprinkle this stuff onto your dogs poop, then you have the time to pick the poop up! Sadly, these home remedies don’t work on all dogs, and in most cases they only work for a short period. I do not recommend these home remedies. At the first sign of your dog eating poop, you are naturally grossed out, and maybe even a little embarrassed, but its important to remember that coprophagia is more common than you think. You should always take your dog to the vet to rule out any medical issues, and then work on the behavioral reasons. The best way to discourage this nasty behavior is to always pick up after your dog, lower your dogs stress levels, feed a good diet, and practice the recall commands. Remember that punishing your dog will not work, and will only make things worse. Have you ever witnessed your dog or another dog eating poop? Do you have any tips to share? I would love to hear from you, please share your thoughts below. Hi Jenny. I am a dog owner and have seen this behavior in many dogs. Yes, it is gross. and I agree with you on most of your recommendations. But I have often wondered why they did this and as you explained it made sense. I have seen this behavior in other dogs but our dogs never seemed to have this problem. We have always trained our dogs and I had never come across this kind of behavior. But then again they have always been a puppy first. My shitzu is a very picky eater. Most of the dogs that we have had are fast and furious at eating, but our Bear (that is his Name) will sniff and walk away. This was a big problem because I was forever changing his brand of food. Bear came to us at three years old and already had this problem. I do not believe in giving dogs human food. But I did find a solution, he has to eat at a certain time of the day every day and if he didn’t eat within 10 minutes I would remove his food until the next feeding. Now he is eating fine and getting a good healthy look. He is still a moocher with those big puppy eyes watching you eat, he gets sent away to go lay down, off he goes with his tail down. Well thank you for this post and I will keep you in mind if I need any help for our puppy. Thank you for your comment. You are lucky to have never experienced poop eating behaviour in your dogs, as it is very common among dogs. It sounds like you are doing a great job with your dog Bear, by not giving him any human food, and by teaching him to eat at a certain time of day to maintain a regular routine. That’s funny that Bear only barks in his sleep, he must be pretty sound asleep and dreaming away. I am glad you enjoyed my post, and if you need any further advice or help for your puppy please check my website. When I saw your title, I just had to read the whole post. By the time I finished it I was very grateful that I am not a dog! And I will certainly stop before I let a dog lick my face again! I don’t have a dog right now, but have had many in my life and this was something I was fortunate enough never to see. I think the causes of why a dog would do that seem very logical. If I was a bored dog locked up in a small kennel who got punished every time I pooped, I might too be creative in getting rid of the poop! It would take me a long time before i ate it though! Great post and this will certainly come in very handy for a lot of dogs. You did a great job of giving solutions. Hi Tim thank you for your comment. It sounds like you have been lucky enough never to have witnessed a dog eat poop, or own a dog that has. Unfortunately, this is a very common problem for many dog owners, myself included. To us dog owners it is embarrassing, and very gross, but to dogs it is none of those things. I am so glad you enjoyed my post, and the solutions that I mentioned. Hopefully you will never encounter this problem, but in the case that you do, you will know how to handle it. Wow, thanks for the methods to get dogs from eating their own poop. As disgusting as it is, I feel like it just isn’t healthy for them, am I right? My girlfriend has a little jack russel and they can be pretty smart like some of the things you listed, getting your attention, to keep a clean area, or to avoid being punished. Hi Nate, thanks for your comment. Poop eating is very disgusting to us humans, but dogs don’t find it gross, or do it to gross us out. Always make sure to rule out any medical issues, and then address the behaviour. Eating their own poop is not harmful, but when they eat other animals feces, it is definitely a concern, as they are putting themselves at risk for getting sick.